I was very excited to make these Lemon Macarons with Limoncello Buttercream filling. 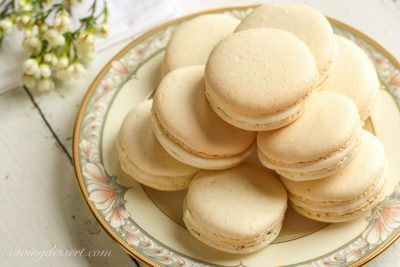 I love the thin crisp layer on the outside, the little feet that form around the bottom and the soft, sweet middle characteristic of a good French Macaron. And I love that they’re not hard to make but you have to find that happy spot where the batter is not too thin, and not too thick. My previous attempt (Chocolate Macarons) were a little under-mixed and could have used a few more turns of the spatula; these could have used a few less stirs. Third times the charm! I thought these were really good but had to get them out of the house share or risk my jeans getting that much tighter, and tight jeans on me is not the same as tight jeans on Jillian Michaels. I shared these with some friends and co-workers and the feedback was terrific – “Ohhhh’s, ahhhh’s, fantastic, a huge hit, super lemony, better than expected, above and beyond good, a surprisingly delicious treat and my favorite – friggin’ awesome!” Maybe they were a little overly effusive in hopes the treats keep coming their way, or maybe not! I think these are terrific and there is no doubt I will make them again. As with making any meringue, it is best to make them when the weather is less humid. A bright sunny day is best – no rain! I did not add food coloring so they may not look very lemony. Even so, they are surprisingly tart, creamy and sweet. You’ll never regret learning how to make macarons! The night before: Separate the egg whites and place in a covered container. Allow them to sit at room temperature overnight. Zest 1 lemon and spread the zest on a paper plate or paper towel. Allow it to dry overnight. Line two cookie sheets with parchment paper (circles traced for easy piping). Sift together the almond flour and confectioners' sugar. Stir in the lemon zest and set aside. In a large bowl of a stand mixer combine the egg whites and granulated sugar. Turn the mixer to medium (speed 4 on a Kitchen Aid) and whip for 3 minutes. Increase the speed to medium-high (speed 7) and beat another 3 minutes. Turn the mixer up to 8 and beat another 3 minutes. Add the food color (if using) and whip for one more minute on high speed. You should now have a very stiff, dry meringue. The whisk attachment will hold a large clump of meringue in the center. If not continue beating for a minute at a time until it does. Remove the meringue from the whisk attachment and set the whisk aside. Add the dry ingredients all at once and fold them in with a rubber spatula. Gently fold until all the dry ingredients are incorporated and you have a shiny smooth batter. If you spoon some out and drop it back into the mix, it should blend back into the remaining batter within about 45-60 seconds. If it remains as a dollop on top, fold the batter a few more times. Spoon some of the batter into a piping bag fit with a 1/2 inch round tip. Pipe the batter into the pre-traced circles on the baking sheet. Stop piping before the circle is filled as it will spread a little on its own. Rap the baking sheet firmly on the counter or floor to remove any air bubbles. Allow the macarons to sit at room temperature for 60 minutes. Bake in a preheated 300 degree oven for 18-20 minutes or until you can peel the parchment paper away cleanly. If you pick up a macaron and the top comes off, it's not done. Remove the parchment paper to a cooling rack and cool completely before filling. In the bowl of a stand mixer fitted with the paddle attachment, beat the butter and cream cheese on medium speed until light and creamy. Add the Limoncello, lemon juice and vanilla. Blend another minute or until fully incorporated. Reduce the speed to low and gradually add the sifted confectioners' sugar and beat until fluffy and smooth. Pipe the Buttercream in mounds onto half the macarons. Top with the other halves and twist to distribute. Store in an airtight container and refrigerate until ready to serve. Allow them to rest a room temperature about a hour before serving. I hope you’ll give them a try soon. They are fun, delicious little cookies. Hope you have a lovely week – thanks so much for stopping by! What is the size circle do you use for the template on the parchment paper? In the directions you say “Add the lemon juice (and paste food color if using)” in step 5, what lemon juice are you referring? Hi Lauren – great question. 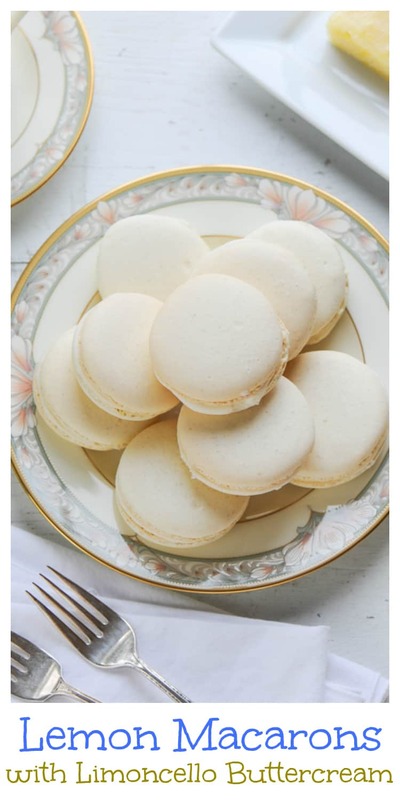 In step 5, I must have made a mistake – there is no lemon juice in the actual macaron shell. Thanks for catching that. I have updated the recipe with the correct steps. The size of the macarons in these photos was a little large and since then I have gone to a smaller cookie. I trace a small biscuit cutter or shot glass (about 1 1/4-inches in diameter) on parchment paper to use as a guide. See this recipe HERE for a size comparison. Hope you enjoy these cookies. Once you get the hang of it, they’re such fun to make! Please let me know if you have any other questions, and thanks for catching the error. Is there a way to save the batter? I love lemon macaroons but this made waayyy more than I was expecting. Hi Mallory – I really don’t know if the batter will keep. I’ve never tried saving it. It does make a lot of cookies. 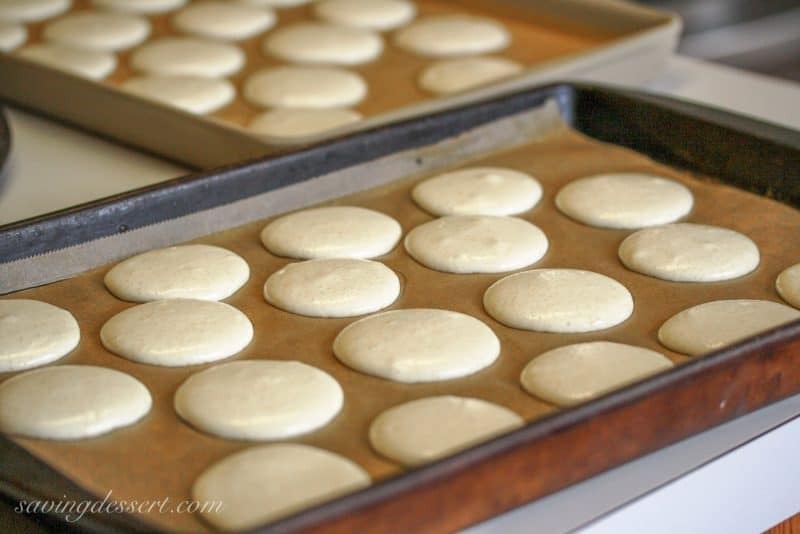 If you have parchment paper, just pipe out all the batter onto various sheets and bake. You can keep the shells unfilled for a few days. Hope this helps. Beautiful macarons! 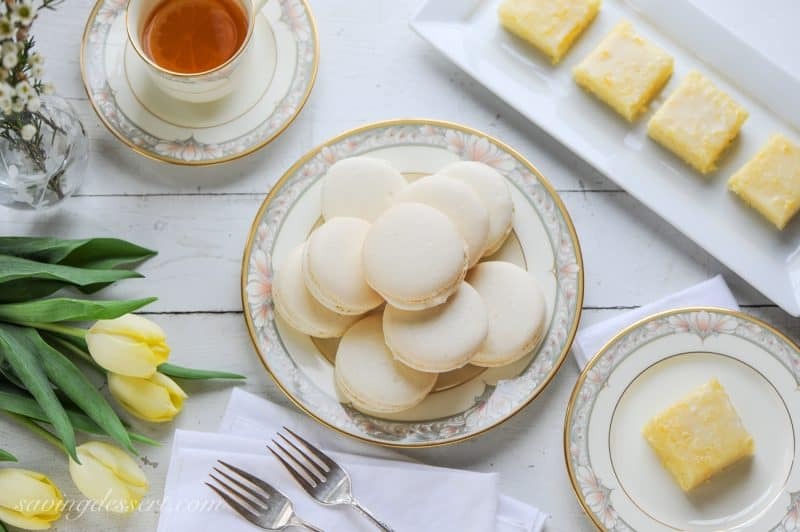 I love lemon treats and this is so lovely for Spring. I've only made macarons once but it was a great success and I did many of the same things you mentioned in your tips. I would love to try this lemony version! Oh wow, your macarons look amazing! I totally love the sound of the limoncello buttercream too! Wow! These look incredibly good. I love lemon recipes…and your tips are great! Thanks for sharing! Oh, it's raining lemons here! I loved these beautiful macarons…seriously, very beautiful and droolicious! These macarons are PERFECT! I love the clicks.<br />Thank you for sharing the tips too, Tricia. Tricia, you are the macaron queen! These look beautiful and sound amazing, Loos like you had alot of fun making them! Tricia, these look so delicate but yet so rich with flavor. So supreme! Do you know that I still haven't even tasted a macaron? These are so lovely and I'm always a fan of a lemon dessert. These babies just went on my to-try-list for this year. <br /><br />Beautiful photos too, Tricia! Mary – these will be a great first cookie then! They are packed with flavor and it is such a surprise when you bite into one. The comments from co-workers are real – they loved them. Hope you enjoy them too! (Read all the tips over a few times and check out the step by step instructions from my chocolate macarons too.) It helps!